1959 BSA CA10 R Super Rocket 1-off (marmite) special. Just arrived back in the UK, from the states, this unique 650 BSA. Fitted with electronic ignition, it starts easily and sounds good. Historic vehicle so no mot needed and free road tax. Will be sold registered on an age related plate. 1978 Triumph 750 Tiger - Just in from the states. A one owner bike in stunning condition having covered only 9401 miles. Matching numbers. Just been serviced, brake fluid changed, new tyres, chain, battery. Was let down only by faded paint on the tank, which has now been re-sprayed. Starts easily and sounds good. Now registered (historic vehicle, free road tax and no mot required) and ready to go. 1979 Triumph T140 Bonneville - just arrived from the States. A clean, tidy, good running bike that starts easily and sounds good. Matching numbers. Just been serviced, tyres, battery, chain and brake fluids changed. Now registered and ready to go. 1980 Triumph T140 Bonneville. 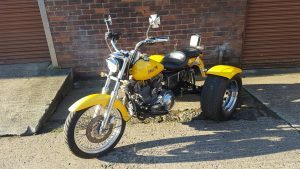 A matching numbers UK bike. Mot'ed August. Recent tyres and battery. Starts easily and sounds good. 1966 BSA A65 Spitfire - just in from the states. Matching numbers. Started easily and sounds good. Currently stripped and being rebuilt with new paint, rims, spokes, tyres, mudguards, battery, etc. Historical vehicle so free road tax and mot exempt. Will be sold registered, on an age related plate and ready to ride away. 1969 BSA A65 Lightning chopper Beautifully crafted in the U.S. using a Ron Finch Totem pole springer front end. 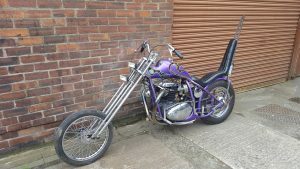 Starts easily and sounds good/loud (no silencers, straight through pipes) Historic vehicle registered on an age related plate, free road tax and no mot required. Let down by paintwork which is showing signs of age but could be used as is.